The BR Beer Scene: Westvleteren 12 in the United States - Update! It looks like the talk of Westvleteren 12 making it's way to the United States is more than just talk. 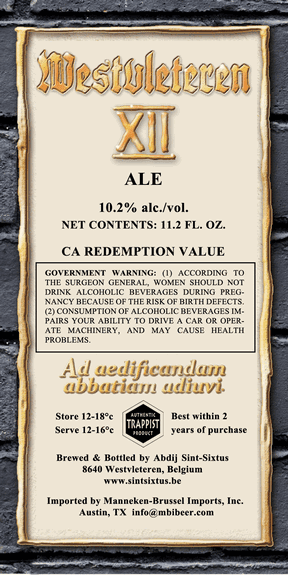 Recently they have submitted (and had approved) the labeling for the bottles in our market. They can get away with just a custom bottle and a cap in Belgium but the rules here are a lot more strict and bottles have to contain certain information about the beer. The craft beer guys over at Beernews.org are all over this Westvletern 12 stuff. 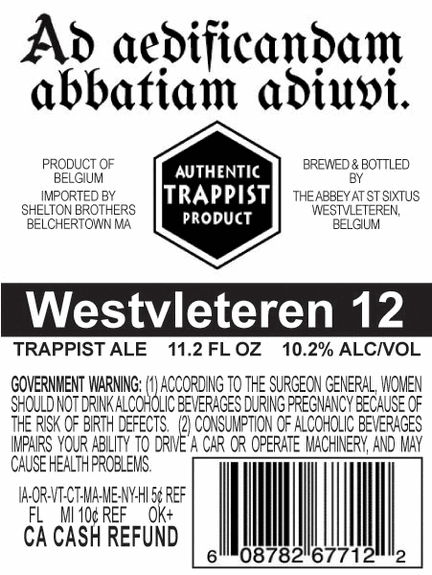 Or, Westvleteren XII as it turns out. Now the real question is, how much will these gift packs cost? The rumors have them wholesaling for $50 to $60, so I think a $100 price tag for the pack of 6 bottles and two glasses is what we should expect. Will I still buy one? Absolutely... but probably just one at that cost. How about you? Post a comment and let me know if you'd be in the market for $100 per gift pack. I'd do it for sure. Not many other beers that I'd spend that kind of money on but I'd bite the bullet for 12. Would really have to plan out tastings of the six pack for special occasions though. Yeah, I know I'd buy a set... 6 Westy 12s and two glasses for $100 (if that's the cost) isn't even a terrible deal. If you value the glasses at $15 each which isn't absurd, that's $70 for the beer, so slightly over $10 per bottle. Too expensive to make it a regular drinker, but not too expensive to buy and save for a few special occasions. Glad to have someone from Australia reading! About the only Australian beers we get are Foster's and Cooper's but I know there is plenty more down there.